If you’re ever considered retiring to a new area or even a new country, take a long vacation there first—and make it a double-duty trip. You’ll relax and see the sights—but you’ll also look around at homes and neighborhoods, talk to natives and to retirees who have settled there, and maybe even take a peek at the local health-care amenities. You’ll have a good time—and when you’re done, you’ll have a much better idea of what it’s like to live there than from the usual kind of visit. 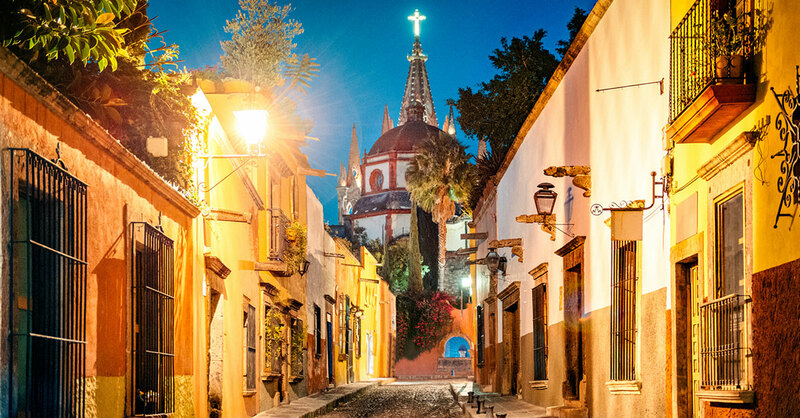 Your first glimpse of San Miguel de Allende, one of the most popular destinations for Americans looking to retire in Mexico, will likely be the spires of the Parroquia de San Miguel Arcangel church rising above the tree-shaded, shop-surrounded central plaza, El Jardín. That alone may be enough to inspire you to come back for good. Many artists have fallen under the spell of the streetscapes of rose-colored colonial houses lining cobblestone lanes and easygoing lifestyle, and their works are showcased in galleries surrounding the poinsettia-filled cloisters of the Escuela de Bellas Artes. The town, located 170 miles north of Mexico City in an upland valley (elevation, 6,200 feet) surrounded by low hills, has a year-round population of 70,000—and about 7,000 of them are American expats. Those numbers expand considerably during the popular winter tourist season. Those crowds have led to trinket shops and tourist restaurants in the main square, to be sure, but the locals and expats know where to go to find lovely galleries, shops and excellent restaurants as well as a roster of festivals and other events. Average temperature in the coldest months, December and January, is 74°F, with an 82°F average in the April-to- mid-June hot season. Housing. A well-equipped and character-filled two-bedroom apartment in the historic center rents for about $2,000 a month. You’ll reduce the cost to $1,000 or even less without sacrificing safety or comfort by locating in Colonia San Antonia, Guadalupe, or one of the other quiet and colorfully authentic outlying residential neighborhoods within easy walking distance of the center of town. Dining out. A meal for two in a white-tablecloth restaurant, with wine, is almost always less than $50. Transportation. Guanajuato and Queretaro International airports are each a little over an hour away by car, and both offer nonstop flights to Houston and other US hubs. Health care. San Miguel has two hospitals and other excellent health-care facilities with English-speaking staff, and other major hospitals are within easy reach in Querétaro, 30 miles to the southeast. Safety. Violent crime, when it does occur, is largely confined to disputes over drug turf or family vendettas—both are easy for expats (as well as tourists) to avoid. However, muggings and petty theft are a concern. It’s advised not to flash expensive jewelry and other accessories and, especially when traveling after dark, to use a trusted taxi service such as TransportArte. To see whether San Miguel de Allende is a place you’d like to live, plan to stay at least two weeks to check out the scene. Use the opportunity to strike up conversations with people you meet, especially expat Americans (we’ll tell you how to find them below). Check out neighborhoods—one fun way to do this is to do some low-stress real estate shopping. It’s best to do so outside the busy January-to-April tourist season when the town is relatively quiet, hotel prices are lower and you’ll have a wider choice of accommodations. Good central places to base yourself are pretty and popular Hotel La Morada, a colonial house where rooms surrounding a flowery courtyard start at about $105 a night, or the charming Casa Los Helechos, a nearby bed and breakfast, with rooms from $65 a night. Interested in renting an apartment or house for your vacation? In addition to international rental sites such as Airbnb.com and VRBO.com, a good source for short-term apartment rentals is InternetSanMiguel.com. San Miguel Rentals is an English-speaking agency that specializes in short-term stays. Once in town, check out the bulletin board at the Instituto Allende, a noted art and Spanish-language school, and the town’s many other similar institutions geared to foreign students for local apartment/house rentals as well as other services. A Yahoo residents’ forum, Civil_SMA, is a gold mine of information for foreigners thinking of settling in San Miguel. Residents and ex-pats alike will tell you that some of the best food in town is the simple, homey fare at El Rinconcito, in the San Antonio neighborhood, and Hecho en Mexico, sin the historic center. Once you’ve seen El Jardin and the surrounding sights in the center, take a walk of about a mile across town to El Charco del Ingenio, an enchanting botanic garden where exotic plants flourish. A little farther afield, about eight miles outside the town center, is the Santuario de Atotonilco (easily reached by taxi), a baroque church that’s often called the “Sistine Chapel of Mexico” because of its colorful frescoes.